Own the exclusive Miriam Cup. A unique opportunity for Women to participate in bringing a beautiful legend to life. Michael Strauss Silversmiths, in conjunction with Yemini, have created their own interpretation of the Miriam Cup. In silver with a hand-hammered finish, the cup is decorated with an antique Yemini design of Miriam dancing with her musical instruments. Further completing the legend is the gold band set with cabochon stones encircling the area above the stem of the cup. 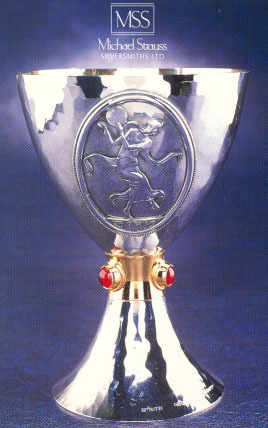 The Miriam Cup has been produced in limited numbers and can be bought exclusively at Michael Strauss Silversmiths. Call (212) 744-8500 today to reserve your cup and participate in a legend.